Data is everywhere. It’s captured with every step we take and every button we click. If you’re conducting business online, data should be at the heart of everything you do. Here are four reasons why it is so important for everyone on the digital team to be able to understand and apply analytics. The days are over where it took months to gather data, and days to run a report. In the digital world, campaigns and content can be changed in minutes. Online interactions can be tracked and reported in real-time. The data we have about our customers today is more detailed, more robust, and processed more quickly than ever before. In order to effectively leverage real-time data, the ultimate end users of the data must take a more active role in reporting and analyzing it. The days are over where being an analyst required a PhD in statistics and an office in the basement next to the mainframe computer. Thanks to technology, many of the digital analytics tools like Google Analytics and Adobe Analytics are designed to do the statistical heavy lifting. Whether what’s needed is advanced segmentation queries or complex data visualizations, the tools make it achievable to accomplish these tasks without an advanced stats degree. Analytics tools these days help make reporting more visual, creating a story to tell utilizing the data. Even the least mathy among us can be empowered to do very sophisticated analysis once armed with the fundamentals of digital analytics. The days are over where marketers and copywriters relied on gut feelings to make decisions. It’s not enough to proclaim yourself a subject matter expert or cite your years of experience anymore, especially when it comes to justifying digital business decisions. With the quality and quantity of data at our disposal, if you aren’t using your digital analytics data, you are ignoring your customers. This is self-sabotage in an increasing customer-centric digital world. Data can also be implemented to improve website user flows and calculate ROI, which can be very useful to marketers. In order to know if your digital efforts are a success, it is imperative to set goals and measure performance against them. If you can’t measure it, you can’t improve it. The days are over where the marketers and copywriters worked separately from the analysts. The best digital analysts aren’t the people with the deepest math knowledge or the flashiest spreadsheet skills. The best digital analysts are the people with subject matter expertise in the topic they are analyzing. A report is just numbers if it doesn’t have context around it. A content manager who deeply understands the content hierarchy and flow of the site with only 1 month of analytics experience will likely find deeper insights and opportunities in the data than an analyst with 5 years of experience who doesn’t understand the content. It’s no longer a world where the marketers and copywriters work alongside the analysts. The marketers and content creators *are* the analysts. There will always be a need for pure analysts or “data scientists” to handle complex data challenges. But thanks to the hard work of these data scientists, digital analytics tools exist that make data accessible to all of us. Not only is data everywhere, data is for everyone. Whether you’re in charge of marketing, content, user experience, or technical infrastructure, there is digital analytics data that exists that will help you better understand your customers and more effectively do your job. If you want to take your career to the next level, incorporate analytics into everything you do even if “analyst” isn’t in your title. Gathering analytics requirements from the business for what should be tracked. Designing the implementation based on those requirements. Implementing the analytics tracking code to collect the data. Involve the analytics team early in the process to allow sufficient time to design and implement the solution. Analytics data can be captured on the page load, or on the click of some element. From a scalability and ease of implementation perspective, it is far easier to implement tracking on page load where a new URL is rendered. That’s not to say that onclick tracking should be avoided entirely, but be aware that onclick tracking lends itself to being more complex, more manual, and less scalable. There are ways to make onclick tracking more scalable by adding CSS elements specifically related to data collection, but the front-end developers would have to be provided with a spec for what additional CSS definitions need to be added to which elements, what the values look like, etc. Onclick tracking does not happen automatically. All tracking based on click or hover interactions must be custom-defined and custom-coded. 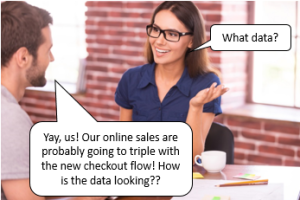 Excessive onclick tracking can have an effect on cost. Certain tools like Adobe Analytics have a pricing model based on server calls. Using Adobe as an example, each Adobe contract specifies a certain amount of allotted server calls per month. A server call happens each time a packet of data is sent to Adobe, which means one server call each time a visitor loads a page, and one server call each time a visitor clicks on a tracked element. By gratuitously adding onclick tracking, it can cause server call overages and additional costs. Use a data layer and tag management tool. Industry best practice is to have a tool-agnostic data layer on all the pages of your site, and then a tag management tool like Tealium or Adobe Dynamic Tag Manager to map the data layer values to the appropriate variables in your reporting tool. Resist the urge to track everything. Only track what is essential, and what will yield actionable information. It’s better to have 10 really solid reports with meaningful information, than 100 reports full of “maybe that will be interesting to look at someday” information.